Ziyu Liao performed her miniproject in WS 17/18 (November 2017 – March 2018) at the Section of Experimental Oncology and Nanomedicine (SEON), Department of Otorhinolaryngology, at the Universtätsklinikum Erlangen. SEON works on the development of superparamagnetic iron oxide nanoparticles (SPIONs) for medical application as contrast agents for magnet resonance imaging (MRI) or as magnetically guidable drug transporters for magnetic drug targeting (MDT). For MDT drug-loaded SPIONs are applied intraarterially into the blood stream and the nanoparticles are accumulated with an external magnet at the desired place (e.g. tumor, atherosclerotic plaque). For medical applications it is mandatory that the applied SPIONs are safe for the patient. Therefore, it must be investigated how (immune) cells in human blood behave when SPIONs are accumulated with a magnetic field. Neutrophils are the most abundant immune cells in the human blood and are essential to initial defense to foreigners, such as bacteria, viruses, and other particulate structures. For clearance of invaders by neutrophils, they remove them by phagocytosis, inactivate them by degranulation or release of reactive oxygen species or immobilize them by the ejection of chromatin decorated with the granular proteins from cytoplasm as neutrophil extracellular traps (NETs). In her mini project, Ziyu investigated the reactions of neutrophils in whole blood or in isolated form in the presence of SPIONs with different sizes and various coatings. Using fluorescence microscopy and flow cytometry she found that agglomerations of non-colloidally stabilized SPIONs induce NET formation by isolated human neutrophils and in whole blood. Colloidal stabilization of nanoparticles with biocompatible layers of either human serum albumin or dextran reduced agglomeration and NET formation by neutrophils. Based on Ziyu`s initial data further experiments under static and flow conditions in vitro and in vivo were performed. We found that colloidal stabilization of the SPIONs prevented vascular occlusions in vivo even when magnetically accumulated. We conclude that higher order structures formed during nanoparticle agglomeration primarily trigger NET formation, whereas colloid-disperse nanoparticles behave inert and are alternatively cleared by phagocytosis. These data were summarized in the publication by Bilyy et al. “Inert Coats of Magnetic Nanoparticles Prevent Formation of Occlusive Intravascular Co-aggregates With Neutrophil Extracellular Traps” in Frontiers in Immunology. Pictures from Ziyu`s miniproject: fluorescence microscopy of isolated neutrophils in PBS. Upper row: controls; middle row: non-colloidally stabilized SPIONs form agglomerates and cause NET formation. Lower row: colloidally stabilized SPIONs do not cause NET formation. 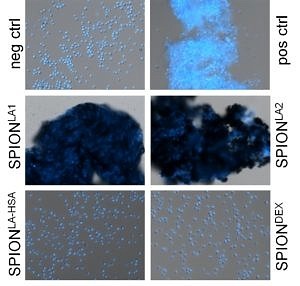 DNA from neutrophils is stained in blue, SPIONs are black. Picture courtesy of and copyright © 2018 Bilyy, Unterweger, Weigel, Dumych, Paryzhak, Vovk, Liao, Alexiou, Herrmann and Janko. This is an open-access article distributed under the terms of the Creative Commons Attribution License (CC BY). The use, distribution or reproduction in other forums is permitted, provided the original author(s) and the copyright owner(s) are credited and that the original publication in this journal is cited, in accordance with accepted academic practice. No use, distribution or reproduction is permitted which does not comply with these terms. Front Immunol. 2018 Oct 2;9:2266. doi: 10.3389/fimmu.2018.02266. eCollection 2018.